"Sushi Roll" Sammie "Bento Box"
In a blender, combine marinade ingredients; process until smooth. Reserve until needed. In a zip bag, combine pork and 1/3 of marinade. In another bag, combine remaining kabob ingredients and 1/3 of marinade. Marinate for 1 hour in refrigerator. Drain both bags, discard marinade. Pierce ingredients on 8 skewers, beginning and ending with an orange. 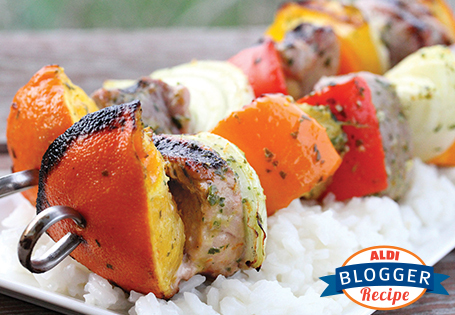 Grill kabobs 3 minutes, rotate and continue cooking for 3 minutes, brush kabobs with remaining marinade. Flip kabobs over and repeat. Cook rice according to package instructions. While rice is cooking, combine the coconut milk, sugar, salt and vanilla in a small saucepan. Bring to a boil, reduce heat and simmer for 2-3 minutes. Strain and set aside. In a mixing bowl, combine the rice with the coconut mixture. Stir gently. Cover and allow to rest for 15-20 minutes. Serve kabobs over coconut rice. For an inexpensive alternative to store-bought coconut milk, follow the directions below. This can be used for cooking or enjoyed on its own. In a small saucepan, combine 1/4 cup unsweetened almond milk, 1 tablespoon coconut flakes, 1/4 cup plus 2 tablespoons sugar and 1/4 teaspoon vanilla. Bring to a simmer and continue cooking for 2 minutes. Transfer to a blender and process until smooth. To achieve the taste of sticky rice, prepare long grain rice but cook for an additional 5 minutes.